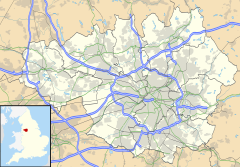 Besses o' th' Barn (/ˌbɛsɪz ət ˈbɑːrn/; commonly known as Besses) is an area of Whitefield within the Metropolitan Borough of Bury, in Greater Manchester, England. The ward population of Besses at the 2011 Census was 10,664. It lies between Radcliffe and Prestwich. Between its opening on 1 February 1933 and 17 August 1991, the locality was served by Besses o' th' Barn railway station on the electrified line from Manchester Victoria to Bury. The station was closed for eight months for conversion to Metrolink, re-opening on 6 April 1992. A local landmark is the three-layer bridge constructed around 1968. This arrangement enables Bury Old Road to run under the Manchester Metrolink line by the town's eponymous Metrolink station and over the M60 motorway near Junction 17. McDonald's, Aldi and the Co-op have stores on the retail park where Bury New Road and Bury Old Road cross, while Besses United Reformed Church, designed by Alfred Waterhouse, stands nearby. The area is the home of Besses o' th' Barn Band, a brass band formed in 1818. Notable people who lived or were otherwise based in the area include John Horsefield, Thomas Thorp and John Warburton. The area was also at one time the location of Whitefield Brewery. ^ "Bury Ward population 2011". Retrieved 4 January 2015. ^ Hartwell, Clare; Hyde, Matthew; Pevsner, Nikolaus (2004). Lancashire: Manchester And The South-East. Pevsner Architectural Guides: Buildings of England. Yale University Press. p. 95. ISBN 978-0-300-10583-4. Retrieved 9 July 2012. ^ "Besses o' th' Barn Band". Retrieved 9 July 2012. ^ "Report of the Council to the Ninety-fifth Annual General Meeting". Monthly Notices of the Royal Astronomical Society. LXXV (4): 250–251. February 1915. Bibcode:1915MNRAS..75..250.. doi:10.1093/mnras/75.4.250. ^ Broome, J. R. (1996). John Warburton: Servant of a Covenant God. Gospel Standard Trust. p. 95. ISBN 1-897837-05-4. Retrieved 19 July 2012. ^ Richmond, Lesley; Turton, Alison, eds. (1990). The Brewing Industry: A Guide to Historical Records. Manchester University Press. p. 371. ISBN 978-0-7190-3032-1. Retrieved 9 July 2012.